Launched in the UK in 2005, the VelaSmooth™ from Syneron Medical Ltd combines Infrared and Radiofrequency (RF) energy technology (plus tissue mobilisation and suction) to produce a device that has proven to be an effective body contour and fat reduction tool, as well as cellulite reduction tool. In fact, it is the first clinically proven medical device to penetrate deep enough into the fatty tissue to treat cellulite and non-invasively contour the body. VelaShape™ is the newest addition to Syneron’s Vela platform. 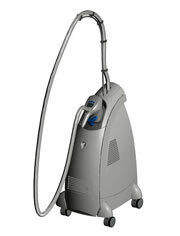 The high power VelaShape™ device claims to enable quicker treatments and results. The Velasmooth™ and VelaShape™ are powered by Syneron’s patented elos™ (electro-optical synergy) combined-energy technology combining Infrared laser light and bi-polar (dual electrodes) RF energy with tissue mobilisation and suction (pulsed vacuum). The synergy of these three components: RF (VelaShape™ has 50W of radiofrequency output compared to 20W with the VelaSmooth™), light, and tissue mobilisation ensure that a depth of penetration beneath the skin layer is achieved for effective, controlled heating and claimed enhanced metabolism of fatty tissue. The conducted RF increases oxygen intracellular diffusion by heating the adipose (fatty) tissue to a depth of 5-15mm; the infrared light increases elasticity of skin and heats subcutaneous fat (beneath the skin) to a depth of up to 5mm, while safeguarding the skin from damage; and the tissue mobilisation (vacuum) manipulates and smoothes out the skin to facilitate safe and efficient energy delivery. Tissue mobilisation is facilitated by rotating, self-cleaning electrodes to ensure excellent coupling with the skin. The Velasmooth™ has received US FDA (Food & Drug Administration) clearance for the relief of minor muscle aches, pain and spasm and the temporary improvement of local blood circulation. And, in June 2005, it also received FDA approval for “the temporary reduction in the appearance of cellulite”, as did the VelaShape™ on launch in 2007. Ideally trained members of the medical profession. The VelaSmooth™ and VelaShape™ do not currently come under current Care Quality Commission legislation and can be used by a trained aesthetician or therapist. Commonly used for the effective treatment of cellulite and also for body firming and tightening. It is sometimes also used post-liposuction to improve results after treatment. Expected results and how long does it last? In a recent pilot study, a 65% reduction in the appearance of cellulite was noted and average hip size was reduced by 3.2cm. Further clinical studies are presently underway and are soon to be published according to the manufacturer. Results (a visible smoothing effect) are said to be noticeable after approximately 4 treatments, according to the manufacturer, however ongoing occasional maintenance will be required. to maintain optimum results. Most people experience no side effects, though some report reddening, swelling or bruising of the treatment area, which typically disappears in a few days or weeks. There are no known long-term health hazards – both light and electric energy have safely been used for decades in medicine, surgery, and aesthetics. Patients may notice a slight increase in urine output following treatment. This is because the broken down cells are absorbed and excreted via the lymphatic system. As long as you are generally healthy and don’t have any skin diseases, scarring or infections in the area treated, there are few medical reasons why patients should not undergo this treatment. It is recommended that the use of NSAIDS (non-steroidal anti-inflammatory drugs) or Aspirin be avoided at least two weeks prior to treatment. Those who suffer from any of the following conditions are also advised against treatment: diabetes (Type I or II), anyone taking photosensitising drugs, or who have known anticoagulative (blood doesn’t clot properly) or thromboembolic (abnormal development of blood clots) conditions or suffer from photosensitivity (sensitivity to light). For Velasmooth™ treatment sessions (30 - 45 minutes long) are usually recommended twice weekly with an average of 8 - 10 sessions in a treatment programme, followed by monthly ongoing maintenance. VelaShape™ is claimed to produce results in as few as 4 - 6 treatment sessions. Private costs for Velasmooth™ treatments depend on the area(s) being treated and can start from approximately £80 per session, or £600.00 for a course of 8 sessions. Left images showing thigh before Velasmooth treatment. Right images showing thigh area after Velasmooth treatment. Click for ALL VelaSmooth™ & VelaShape™ clinics in the UK & Ireland registered and verified by Consulting Room.